An updated SimpleStow v.2.3.1 is available for download for registered users. In this version, along with general maintenance and bug fixes, we have added a function to import and export new EDIFACT message “VERMAS”. 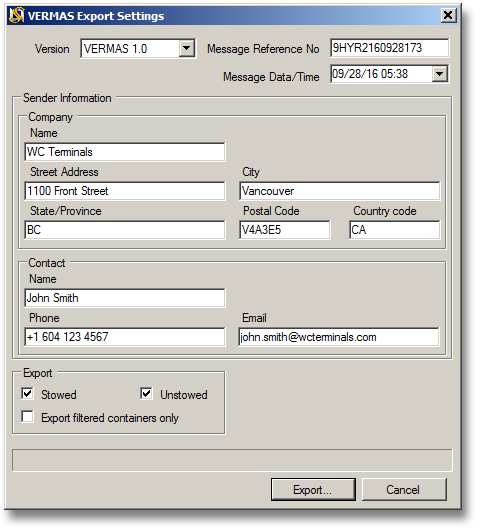 This message is intended to transmit details of containers Verified Gross Mass (VGM) along with the required supporting verification data such as the type of verification method, VGM verification document number, name and contact details of party responsible, in a formal international standard format. New VERMAS message compliments BAPLIE v.2.2 and 3.1 that are already supported by SimpleStow. This set of EDIFACT messages facilitate compliance with amendments to SOLAS regulation VI/2 (Cargo Information) that took effect on July 1st 20016. Now users of SimpleStow can save on fees charged by some operators for manual input of VGM data in their information systems, and/or offer additional services to their container exporter clients converting mandatory VGM data from any custom format to a standard EDIFACT VERMAS message.